We are back this week with another PAWsitively PAWmazing Pawsome Pet of the Week. 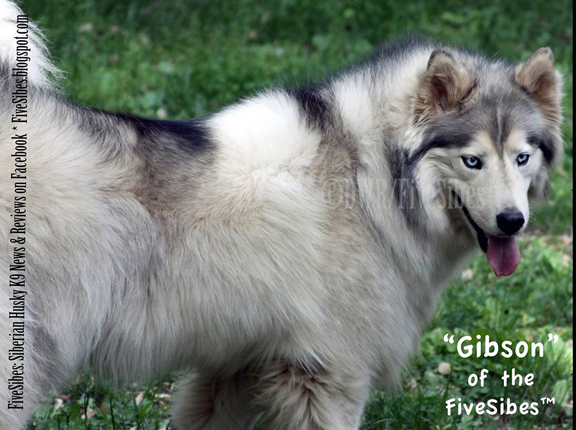 His name is Gibson and he is a 9 year old wooly Siberian Husky and a pack member of the FiveSibes. Gibson is from Kingston, New York in the beautiful Hudson Valley at the foothills of the Catskill Mountains. "My hu-mom tells me I’m pawsome because she says I’m a lovebug. I’m very understanding, patient, and super laid back, and she loves my Gibbie kisses! She says I’m “an old soul” who understands everything! I love my hu-mom and I’m in love with Harley, the alpha of our Siberian Husky pack of five. She’s a year older than me (and she is so beautiful! I have been in love with her since I was four months old!) And, of course, I love my three younger siblings: my brother Wolf, and two sisters Chloe and Bandit. Hu-Mom loves how for a big Husky (I’m about 98 pounds! ), I’m so gentle and I let all my furfamily lay on me (because I’m a wooly and so fluffy, I keep them warm and apparently make a great pillow!) My hu-mom also says I’m pretty pawsome because although I’m an Epi-dog (Canine Epileptic), I don’t let that stop me from being a very happy boy!" Gibson enjoys a number of activities including eating, sleeping, howling, playing doggy puzzle games, spending time with is hu-mom, and playing in the snow. 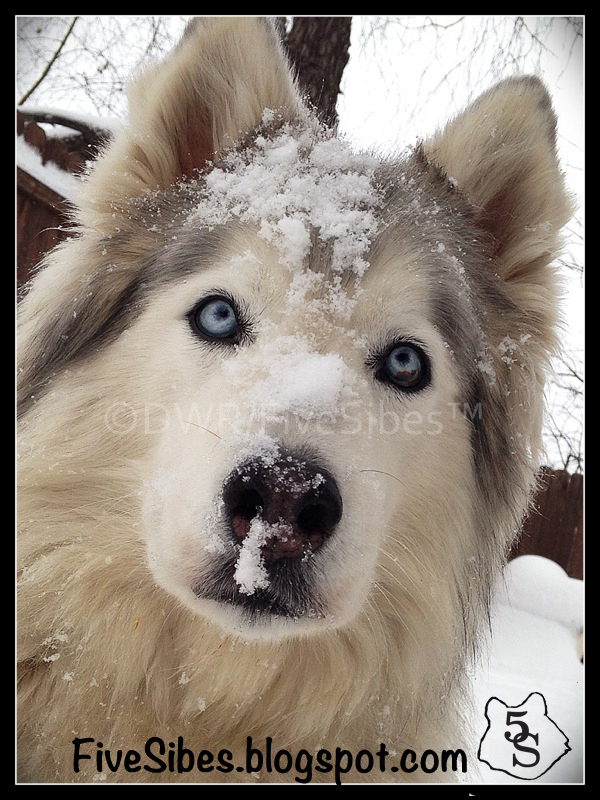 What Husky wouldn't like to play in snow? As a Husky with good taste, Gibson has a couple of favorite snacks and treats. One cool thing about Gibson that I learned during our interview is that he has treats named after him. The treats were formulated for Epi-Dogs like him. Pretty cool, huh? "Well, I do love pizza crust, ice cream, eggs, cheese, homemade hamburger, salmon, green beans, pumpkin, and sweet potatoes, but I have to say my very favorite treat of all is the “Gibbie Snacks” from House Woof Dog Biscuits in Vermont, USA. They are actually named after me because the bakers worked with my hu-mom on developing a treat that us Epi-dogs could have that are all natural. I think being a treat namesake is the coolest thing! Woo! House Woof also donate $1 for each bag of Gibbie Snacks ordered to The Wally Foundation for Canine Epilepsy (they are on Facebook) that offers possible financial assistance for much-needed medications for dogs diagnosed with idiopathic Canine Epilepsy, like me. The treats are sent fresh-baked and are just so yummy! And the fact that Gibbie Snacks also help other Epi-dogs in need, makes it a doubly pawsome treat!" Gibson's special abilities include talking and dancing. Huskies are known for their vocals and Gibson is able to say "I love you" and "ice cream". He has his own special dance called the "Gibbie Hip-Hop Dance". Gibson describes the dance as "kind of a front end hop, a paw slam, and a wiggle and woo all in one"! Gibson's hu-mom is an official Purple Day® for Canine Epilepsy Ambassador and together, they are raising awareness while helping other dogs and humans. "My hu-mom is an author and photojournalist and she wrote a lot of articles and two books on Canine Epilepsy because, she said, she was inspired by me and the journey we’re on. When I first started seizing, my hu-mom wrote about it on social media to see if she could connect with others. A really super nice nurse from Texas contacted my hu-mom and really offered her great info and friendship. And today, six years later, she’s still a very special friend to us! Hu-mom always remembers how she was helped, and she wants to pay it forward to help others going through the same thing. I really like that we can maybe help other dogs who have Canine Epilepsy, like me. Oh, woo! 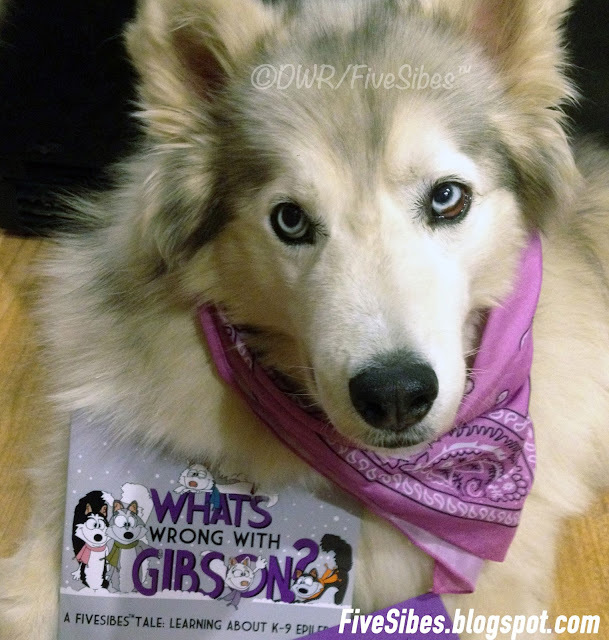 I’m also pretty excited about having a cartoon version of myself (well, all of us FiveSibes do) from hu-mom’s FiveSibes Tales illustrated children’s books, the first one of the series is titled after me – What’s Wrong With Gibson? Learning About K-9 Epilepsy. 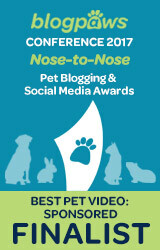 That’s pretty pawsome, and quite possibly my favorite thing! I’m also on the cover of her EPIc Dog Tales: Heartfelt Stories About Amazing Dogs Living & Loving Life With Canine Epilepsy, and have been a “cover dog” for American Pet Magazine and Ruff Drafts promoting Canine Epilepsy Awareness. If my “lovable, adorable, beautiful face,” as my hu-mom calls it, can help other dogs and their hu-families who are dealing with seizures feel more positive and happy, then I think that’s really pawsome." Gibson and his hu-mom have a lot to say about Canine Epilepsy and hope to share their journey with others who might need the information. I asked Gibson if he had any interesting stories or facts that he might like to share. Of course, Gibson is an interesting guy so there isn't much about him that ISN'T interesting! "Woo! I’m in love with Harley, did I mention that?! (winky-winky!) I think that being an Epi-dog is an interesting fact, and I’d like to share a little more about myself and really emphasize how important it is for humans to understand that dogs with Canine Epilepsy are pretty pawsome, and very loving dogs. Once upon a time, the recommendation for a dog with seizures was euthanasia. Woo! Am I ever glad my hu-mom didn’t do that! I was diagnosed by my amazing vet team shortly after my third birthday in 2009 after I had one very nasty scary grand mal seizure, followed a month later by a bad cluster of nasty grand mal seizures that landed me in the emergency vet hospital, which scared my hu-mom. I don’t remember much about them, but she sure does! 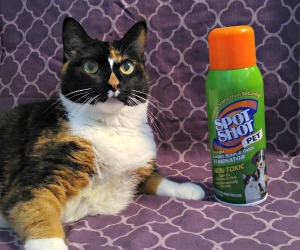 Ever since, my seizures are managed by specifically timed medications and vitamin supplements that my hu-mom is very, very serious about the dose time, and since I get some side effects to the medications, including weak hind issues, my hu-mom also has our vet administer bi-weekly laser treatments that really help. It’s kind of like a spa day for me, I get really relaxed and sleepy afterwards. K-9 Epilepsy Awareness Campaign that my hu-mom named after me! We hope to help other Epi-doggie parents not feel afraid or alone and know that there are many resources and support available to them. 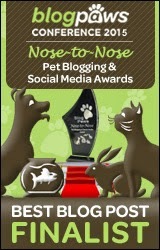 We do important fundraising for Canine Epilepsy non-profit organizations, too. And most importantly, we work hard to educate others and get out the message that with a lot of love and some special care, dogs, like me, can—and DO—live full, happy lives with Canine Epilepsy." 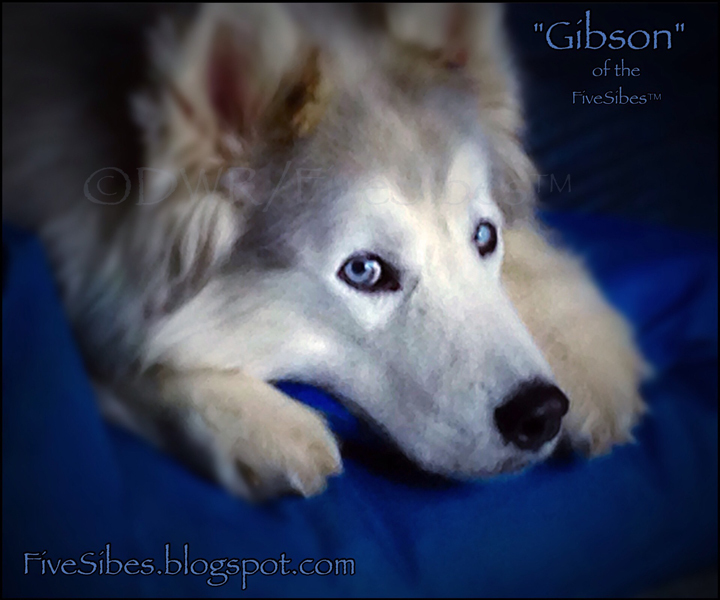 Gibson and the rest of the FiveSibes pack can be found on their blog here. He's also on Facebook, Twitter, and Instagram. Stop by, give him a "woo", and let him know just how pawsome he is! AND Gibson's hu-mom also talks on a radio show called The FiveSibes "The Sibe Vibe" Dog Works Radio Show on iTunes or you can listen in HERE. You can find Gibson's books online here. We'll see you back here next week for another Pawsome Pet of the Week! Woo! Thanks, Mark! Love the all you can eat pawty idea! So nice to meet you, too! 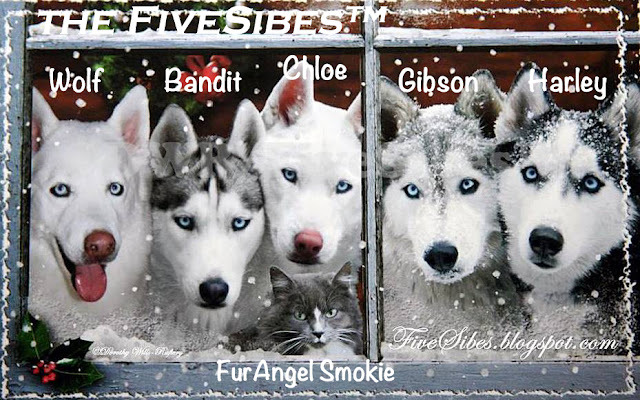 The Five Sibes are so very cool and Gibson is sure very special! Hey it's my Five Sibes Pals!!!! Gibson is a handsome boy! And he's definitely pawesome. Ann, this is SO pawsome! Thanks so much for highlighting Gibson as a Pawsome Pet of the Week! He says, "thank woooo," too! And thank WOO Gibson for the fabulous interview. I appreciate it! Woo, thanks SpeedyRabbit! Gibson says, "I am very fluffy - come on over and let's snuggle!" So sad such a sweet pup has to deal with epilepsy, but he sounds like he is really enjoying his life even with the disease. It is sad, but I don't think it gets Gibson down. He seems to make the most of it and has help from his hu-mom to keep it under control. I think it is so great when dogs like Gibson and their humans try to help others when they are already dealing with so much themselves. Our golden retriever Moses had epilepsy, though his was quite mild, it could still be scary. I love how fluffy Gibson is and what a beautiful group they have there! Thank you so much, Jan! We believe the more we can connect with other epi-dog families, the more we can all help each other to help our dogs. And it is quite staggering to learn of just how many dogs have epilepsy. Gibson says "thank woo" for your kind words, and he's happy you love his fluff!